On the night of 20/21 January we got photographed oriented pyramid crystal halos in the spotlight beam on two occasions. The first occasion, shown above, got us completely unawares and the odd radii stuff was all gone in the next shot which would have had the exposure right. 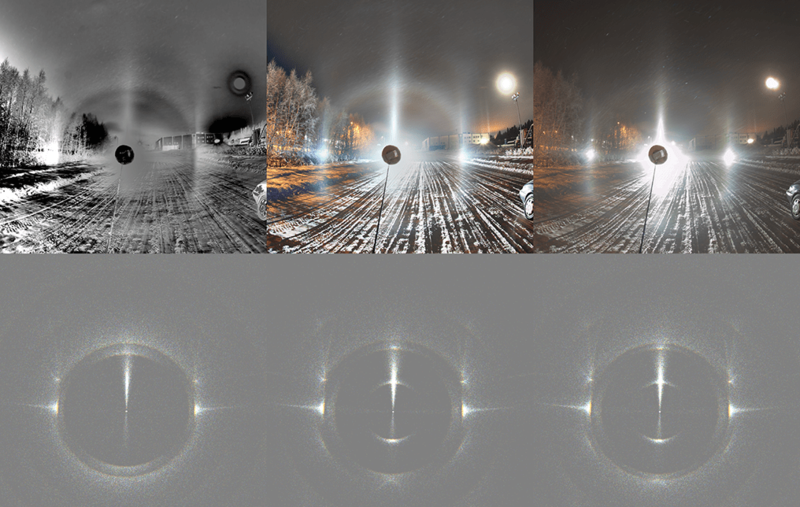 Colored and solid upper and lower 9° plate arcs were seen, but if they were still present when the camera was placed in the beam, they are nevertheless washed out by the overexposure. 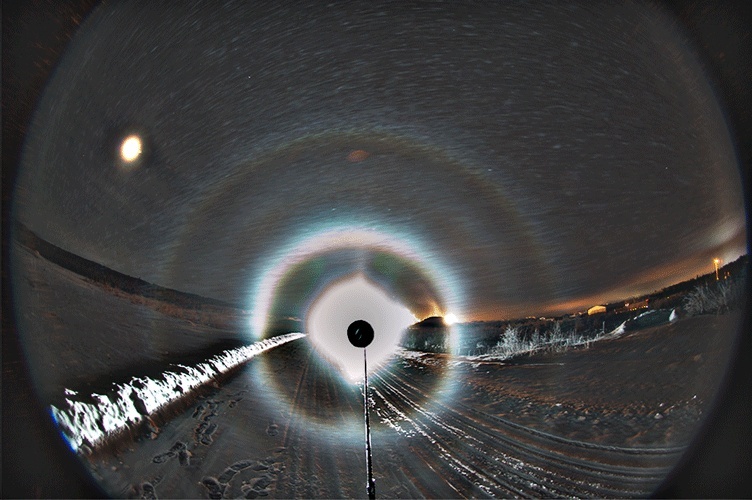 In the photo one still sees the 35° halo and lower 20° plate arc. The lower 9° plate arc was of the 23-6 type as the lamp was about 5 degrees below below horizon. A little simulation study as was necessary to see whether it was column (left) or plate (middle and right) pyramid stuff, but that did not give definitive answer. The plate scenario simulations are identical except that in one is 22° halo and in the other 23°. The 35° and 18/20° stuff above the lamp were initially noticed visually which prompted us take the photo series for this stack. These last photos were taken at 3:30 am. The two photos below are the first photos of the night at 6 pm. We photographed these lunar and beam displays simultaneously. No odd radii yet at this early hour. This entry was posted in artificial light source halos, diamond dust halos, moon halo, pyramidal halos and tagged odd radius halos. Bookmark the permalink.